Copyright 2009 Oxford University Press. 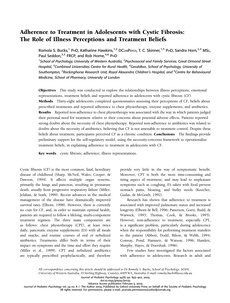 Objectives This study was conducted to explore the relationships between illness perceptions, emotional representations, treatment beliefs and reported adherence in adolescents with cystic fibrosis (CF). Methods Thirty-eight adolescents completed questionnaires assessing their perceptions of CF, beliefs about prescribed treatments and reported adherence to chest physiotherapy, enzyme supplements, and antibiotics. Results Reported non-adherence to chest physiotherapy was associated with the way in which patients judged their personal need for treatment relative to their concerns about potential adverse effects. Patients reported strong doubts about the necessity of chest physiotherapy. Reported non-adherence to antibiotics was related to doubts about the necessity of antibiotics, believing that CF is not amenable to treatment control. Despite these beliefs about treatment, participants perceived CF as a chronic condition. Conclusions The findings provide preliminary support for the self-regulatory model, using the necessity-concerns framework to operationalize treatment beliefs, in explaining adherence to treatment in adolescents with CF.